Our sun recently entered the first sign of the zodiac and so too spring commenced. There’s plenty to learn from the Aries archetype via the fact of its zodiacal placement. Aries signals the beginning of things – birth, identity, individuation. Aries identifies. Think about the amount of vital force it takes to begin something. Aries rules the head and so is headstrong, whip-smart, and energetic. When afflicted, Aries speaks without thinking and acts too impulsively. Aries hits its head. Literally and figuratively. The material world has to bump up against the impish Aries force. Aries translates from the Latin as “ram” and the ram can embody that thing that Einstein once said about insanity and doing the same thing over and over again. Aries is a call to action, the impulse towards self-expression (enter: the abstract expressionist paintings I’ve inserted throughout this piece). Aries is headstrong and prone to seeing things in black and white (remedy: its opposite sign, Libra, and the grey zone), is a bit extreme, and houses no small amount of fiery vitality that will, when left unchecked, burn out. But Aries insists that it’s better to burn out than to fade away. We are here, at the beginning of the beginning, and this means that a. there’s a lot more work ahead and b. let’s be resilient and carry the Aries energy forward. It takes resilience to not only recognize that it’s time to wriggle out from beneath the status quo, but to act. And the warrior-vibe of the Aries says ACT NOW, begin, take risks, gather the extra vitality that the sun offers and go. But the ram’s shadow side tends toward self-involvement and lack of follow-through. It’s shadow side says — the beginning is the middle is the end. As an Aries rising and lover of beginnings, I have a lot to say on this subject and will likely wax about Aries lessons all month. I’ve been thinking about (read: scrolling Instagram) the ultra-perfect branding and packaging that is so abundant right now in the wellness community. Aries likes packaging (and loves adornment and standing out) but she also teaches us about authenticity — not true-to-one’s-brand-authenticity, but authenticity-authenticity. Speaking one’s truth is likely to ruffle feathers and Aries knows that some growth has to happen via the ruffling of feathers. Ethel Schwabacher, Antigone I, 1958. 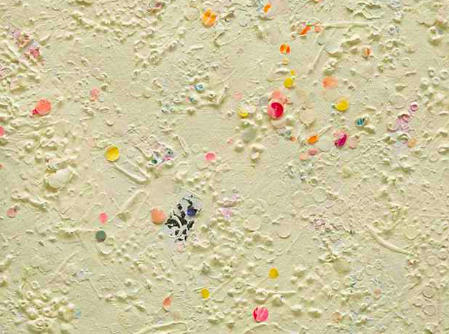 Howardena Pindell, Untitled #18 (detail), 1977. Part of The Thirlby’s mission is to redefine wellness. I encourage you to read the full mission statement here, but I love the call to action: It’s time we take wellness and self-care into social-care for me, you, and all. Health IS our birthright. They also have a resources section with an incredible Intersectional Library with essential radical feminist, social justice, and health texts. It might be useful to think of Aries, which vibrates “I am”, in relation to the idea of intersectionality. Aries knows that in order to extend our knowledge out into the world, we have to begin with the self. But the challenge of Aries is remembering that this self knowledge is only the beginning. Intersectionality, which involves finding common threads or through-lines and coming together, reminds Aries’ self-knowledge to be inclusive rather than exclusive. Aries has some serious physical and mental resilience. Like the panel on Intersectional Feminism at RA MA institute (which I wrote about here), I want to emphasize that the call-to-action mentioned above is an ongoing practice, not just a once-and-done acknowledgement of white fragility or systemic racism. Shouldn’t interrogating white fragility and undoing the uniformity of one’s Instagram feed be as routine as that morning celery juice? And don’t forget — Chiron, our galaxy’s wounded healer, is in the actionable sign of Aries for the next seven years. What to do with these martian energies? I make the following suggestions as much for myself as for anyone reading this: Consistently question (and Aries says: interrogate) your own assumptions and beliefs and invite questions from others, practice resilience, and know that conflict is not an end unto itself. For Aries doesn’t shy away from a conflict and the exalted Aries energy knows that growth happens when we are confronted with issues of identity, ego, and self-concept. We must, after all, recognize (and honor) the other as other before we can recognize the other as self. Subscribe to The Avant-Galaxy weekly newsletter for the contemporary cosmic. For more information or to book a session with me.